YFCU president James Speers, Geoff Thompson from Annaclone and Magherally YFC and Gillian McKeown, events manager from YFCU recently travelled to Tallinn, Estonia to attend Rural Youth Europe’s General Assembly. The General Assembly provides the opportunity to bring together rural youth leaders and key staff members from rural youth organisations across Europe to share best practice and formulate a strategic direction for rural youth NGO’s to promote rural organisations and to help meet the needs of young people throughout Europe. YFCU president James Speers commented: “It was great to attend Rural Youth Europe’s General Assembly in Estonia where many good decisions were made to further our work and develop our rural network. “We had discussions about funding, different targets and the challenges that many organisations face so it was great to share experiences with the other attendees. 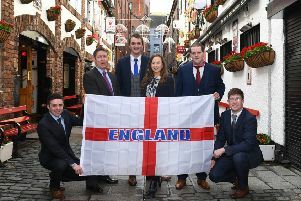 “I was delighted that I was able to nominate Moneyrea YFC member Linzi Stewart as board member for UK and Ireland while Annaclone and Magherally YFC’s Geoff Thompson re-joined the board as board member for European Youth Policy Advocacy. “I would like to pay tribute to outgoing board member for UK and Ireland Paddy Delaney from Macra na Feirme for his hard over the past two years. YFCU member Geoff Thompson who is now entering his second year on the RYE board, provided a lecture to attendees at the General Assembly which was entitled, ‘Brave leadership in a changing Europe’.